Post Hill Press, 9781682610046, 160pp. A young man learns that there is more to being successful than the bottom line. A Paperboy's Fable is a concise, entertaining fable that makes revolutionary points using age old principles. Whether someone is opening a lemonade stand or leading a startup software company, the 11 Principles of Success make A Paperboy's Fable a timeless tale that is as fresh as it is universal. A Paperboy's Fable also features interviews with many professors, entrepreneurs, CEO’s and General David Petraeus. Deep Patel is a young writer and entrepreneur. He wrote A Paperboy's Fable as an homage to his father who, at the age of sixteen, was a paperboy in Boston, Massachusetts. Patel is an active philanthropic contributor in his community. Committed to making sure all children get a chance to learn and flourish, he plays a vital role in The Mentors Project, which has received recognition from the governor of Georgia for advocating literacy and tutoring underprivileged children. "...this entertaining book is ingenious; the cleverly devised tale depicts a business at its most basic level, dramatizing how even a paperboy can use proven strategies, skills, and techniques to grow a thriving enterprise." "Deep is wise beyond his years! A Paperboy's Fable is a hidden gem full of rich entrepreneurial insight that only somebody like Deep could tell in an enjoyable and educational format. I highly recommend this book to anybody with the entrepreneurial itch!" "Prescient and insightful well beyond his years, Deep Patel provides a delightful account of entrepreneurship and the ingredients for success. Budding entrepreneurs and experienced veterans alike will learn and be inspired from the story of Ty Chandler and the lessons embedded therein." "A Paperboy's Fable epitomizes Warren Buffett's investment philosophy. It is an inspirational, entertaining and educational read." 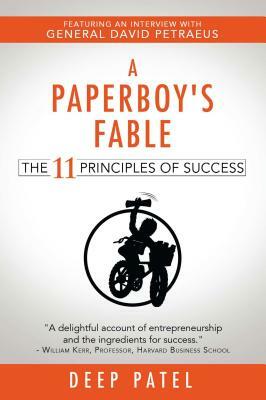 "A Paperboy's Fable is a great book for entrepreneurs of all ages. It is a fun read and packed with valuable insights." "What Deep Patel has to say, on the basis of his research, interviews and reflections, is a true inspiration for millennials—and well worth pondering." "A Paperboy’s Fable is a fun read. I was rooting for Ty Chandler as he made his way from opportunity to success. The bonus is a set of lessons for every entrepreneur."